Harry Potter lovers around the world may want to thank Alice Newton. She was eight years old when her father brought home a manuscript for her to read. At the time, he was working for Bloomsbury Publishing. Alice’s note to her father is part of the British Library’s new exhibition, “Harry Potter: A History of Magic.” It celebrates the 20th anniversary of the publication of J.K. Rowling’s first book about Harry and his friends at Hogwarts School of Witchcraft and Wizardry. 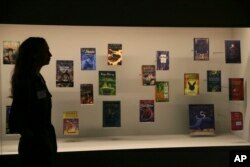 A member of British Library staff poses for a picture with Harry Potter books published in several languages at the "Harry Potter - A History of Magic" exhibition at the British Library, in London, Wednesday Oct. 18, 2017. When “Harry Potter and the Philosopher’s Stone” was released in 1997, Bloomsbury sent just 500 copies to stores in Britain and another 500 copies to British libraries. Now, Harry and his friends are known worldwide. The exhibit at the British Library includes Rowling's outline for her books, her artwork of its characters and a map of the Hogwarts School. It also includes early versions of Rowling’s books that were rejected by other publishers. The show has two rooms. They are divided up based on the subjects offered at Hogwarts. Areas include Potions, Herbology, Care of Magical Creatures and Defense Against the Dark Arts. Each area describes the stories and beliefs that Rowling included in her books. 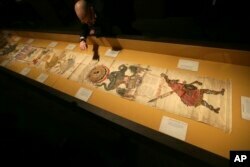 Included in the exhibition are discussions of alchemy, the European traditions that led to modern chemistry, and the Ripley Scroll -- a six-meter-long document from the 1500s. It describes how to make a Philosopher's Stone. The British Library has already sold about 30,000 tickets to the exhibit — the most advance tickets ever sold for a British Library exhibition. The show closes on February 28, 2018. It will then travel to New York for the 20th anniversary of the release of "Harry Potter and the Sorcerer's Stone," the book's title in the United States. ticket - n. a piece of paper that allows you to see a show, participate in an event, travel on a vehicle, etc.